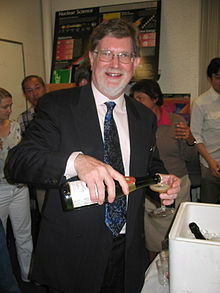 George Fitzgerald Smoot III (born February 20, 1945) is an American professor of astrophysics and cosmology. In 2006 he won a Nobel Prize in Physics for his work on COBE with John C. Mather. That work made it possible to measure black holes and cosmic radiation much more exactly than was possible before. This work gave new evidence for the big-bang idea that the universe was once a big explosion. 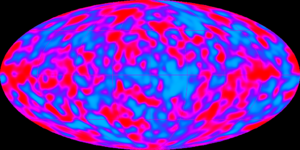 This work was completed using the Cosmic Background Explorer Satellite (COBE). The Nobel Prize committee said: "the COBE-project can also be regarded as the starting point for cosmology as a precision science." Professor Smoot works for the University of California, Berkeley Department of Physics. In 2003 he was awarded the Einstein Medal. Professor Smoot was born in Yukon, Florida. He went to Upper Arlington High School in Upper Arlington, Ohio until 1962. He studied mathematics for some time before going to the Massachusetts Institute of Technology where he was awarded two bachelor's degrees for mathematics and physics in 1966, and a Ph.D. in particle physics in 1970. Smoots cousin, Oliver R. Smoot, also studied at MIT (Massachusetts Institute of Technology), and was made famous for the Smoot measurement of the Harvard Bridge between Cambridge and Boston. The "Smoot" length was marked in paint over 360 times on the bridge and is repainted there every year. Oliver later worked as the Chairman of the American National Standards Institute. Professor Smoot began to study cosmology, and went to Lawrence Berkeley National Laboratory where he worked with Luis Walter Alvarez on the experiment HAPPE, a high up weather balloon for detecting antimatter in the upper atmosphere. He then took up an interest in the microwaves in cosmic radiation which had been discovered by Arno Allan Penzias and Robert Woodrow Wilson in 1964. This work gave new evidence of what the universe is made of. Some researchers thought that the universe was rotating, which would mean that temperature of microwaves would seem different when measured from different angles. With the help of Alvarez and Richard A. Muller, Professor Smoot developed a radiometer to measure the difference in temperature from two angles 60 degrees apart. The radiometer was put on top of a Lockheed U-2 plane, but the measurements seemed to show that the universe was not rotating. It did, however, detect another difference in the microwave temperature on one side of the sky. They called this a dipole pattern and a Doppler effect of the Earth's motion. A doppler effect happens because the Sun, and the Milky Way are moving at nearly 600 km/s. They think this is caused by gravity from the Great Attractor. The measurements from the radiometer showed that one side of the sky was different to the other but this was surprising because it was expected that many differences would be found all over the sky. Smoot was working on finding these smaller differences in the late 1970s when he gave NASA an idea to make a satellite with a detector that was similar to the one mounted on the Lockheed aeroplane. This detector would be much more powerful and it would not be affected by the atmosphere. NASA spent US$160 million on the satellite and named it the COBE. The COBE satellite was delayed after the Space Shuttle Challenger was destroyed, but was launched successfully on November 18, 1989. After more than two years, on 21 April 1992, the COBE research team claimed that the satellite had detected the small differences they were looking for. This was very important in the study of the early universe. The study was "evidence for the birth of the universe". Professor Smoot said: "If you're religious, it's like looking at God." More than 1,000 researchers, engineers and other workers helped to make the COBE. John Mather was in control of the whole project and the experiments that made the COBE possible. George Smoot was in control of measuring the small differences in the temperature of the radiation. Smoot worked with the San Francisco Chronicles journalist, Keay Davidson, to write a book called Wrinkles in Time, all about the team's work. In the book The Very First Light, John Mather and John Boslough write more of the COBE story. Mathers book says that Professor Smoot was giving news of COBE to the press before NASA did. This made problems between Smoot and Mather in the past. After COBE, Smoot helped with another experiment with a stratospheric balloon called the MAXIMA experiment. This ballon took some better measurements than the COBE. Smoot has continued studying cosmic radiatin and now works on the third generation COBE satellite Planck. He is also working on the design of a Supernova/Acceleration Probe (SNAP), a satellite which is to measure dark energy. He has also assisted in analyzing data from the Spitzer Space Telescope in connection with measuring far infrared background radiation. ↑ Katherine Bourzac (12 January 2007). "Nobel Causes". Technology Review. Retrieved 2007-09-05. And Smoot himself can still vividly recall playing a practical joke on his graduate thesis advisor, MIT physics professor David Frisch. ↑ The Royal Swedish Academy of Sciences (3 October 2006). "The Nobel Prize in Physics 2006" (.PDF). Press release. http://nobelprize.org/nobel_prizes/physics/laureates/2006/info.html. Retrieved 2006-10-05. ↑ MIT Press Office (3 October 2006). "Nobelists' work supports big-bang theory". Press release. http://web.mit.edu/newsoffice/2006/smoot.html. Retrieved 2006-10-03. ↑ George Smoot. "The SMOOT as unit of Length". Retrieved 2006-10-07. ↑ 5.0 5.1 Talk of the Nation (6 October 2006). "Winning the Nobel Prize". National Public Radio. Retrieved 2006-10-07. ↑ All Things Considered (7 December 2005). "Smoot, Namesake of a Unit of Length, Retires". National Public Radio. Retrieved 2006-10-07. ↑ Smoot, G.F.; et al. (September 1992). "Structure in the COBE differential microwave radiometer first-year maps". Astrophysical Journal 396 (1): pp. L1-L5. doi:10.1086/186504. http://adsabs.harvard.edu/cgi-bin/nph-bib_query?bibcode=1992ApJ...396L...1S&db_key=AST&data_type=HTML&format=&high=4381f4775710298. Retrieved 2007-09-05. ↑ Associated Press (April 24, 1992). "U.S. Scientists Find a 'Holy Grail': Ripples at Edge of the Universe". International Herald Tribune. p. 1. ↑ Thomas H. Maugh, II (April 24, 1992). "Relics of Big Bang, Seen for First Time". Los Angeles Times. pp. A1, A30. ↑ Royal Swedish Academy of Sciences (3 October 2006). "Pictures of a Newborn Universe". Press release. http://nobelprize.org/nobel_prizes/physics/laureates/2006/press.html. Retrieved 2007-09-05. ↑ Smoot, George; Davidson, Keay (1993). Wrinkles in Time. New York: W. Morrow. ISBN 0-688-12330-9. ↑ Mather, John; Boslough, John (1997). The Very First Light: The True Inside Story of the Scientific Journey Back to the Dawn of the Universe. New York: Basic Books. ISBN 0-465-01575-1. ↑ Lynn Yarris (26 October 2006). "After the Phone Call". Science@Berkeley Lab. Retrieved 2007-09-05. ↑ "Supernova/Acceleration Probe (SNAP)". Lawrence Berkeley National Laboratory. Retrieved 2007-09-05. ↑ "Spitzer Cosmic Far-IR Background Project". Lawrence Berkeley National Laboratory. Retrieved 2007-09-05. This page was last changed on 21 January 2019, at 17:44.